Kate Chopin was an American author from the end of the 19th century and she wrote very interesting stories. I have taken one of the shorter ones and simplified it for pre-intermediate students. The Kiss is a story about love and money. It is about a girl who has to choose between real love and a lot of money. What will she choose? Even though the story has been simplified there are still some words that may cause problems. The words are listed in the following mind map which can (and should) serve as a worksheet. Print out the pdf worksheet file or the picture and translate the vocabulary into your MT. Now, that there are no unknown words it is time to read and listen to the story. Take the mind map, listen and answer the comprehension questions. It would be best to listen to the story at least twice. 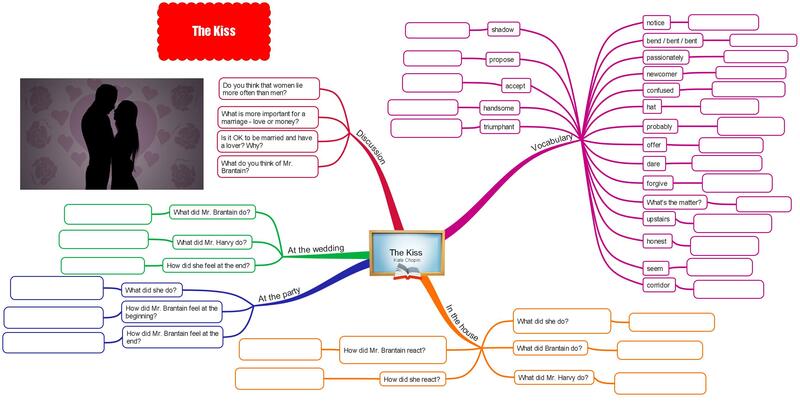 Now there are several games and activities to check your knowledge and understanding of the Kiss story. First, you can try two dictation activities. Listen and click on the sentences you hear. Now you can play several comprehension games. First, you could try the Hoopshoot game. (This game is in Flash and might not play on your mobile device). The second game is called Penalty Shoot out. Answer the questions and score! (This game is in Flash and might not play on your mobile device). The third game is the most difficult one. It is called Fling the teacher and you have to answer all 15 questions correctly to win the game. (This game is in Flash and might not play on your mobile device). The last activity is called Storyboard and your task is to reconstruct the original text. This one is really difficult!!! Are you up to the challenge??? I liked a lot this website. my english is very bad……………………. If you study it will get better soon.